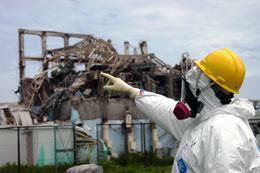 Rising levels of radioactive liquid hamper clean-up effort. In the first hours of March's accident at the Fukushima Daiichi nuclear power plant, workers rushed to flood three damaged reactors with sea water to prevent a catastrophic meltdown. Three months later, water is still being pumped into the cores and has become the biggest obstacle to cleaning up the site. Buildings there are deep in radioactive water, slowing work to a crawl. Storage tanks are rapidly reaching capacity and, if the trend continues, drainage trenches will start overflowing as early as 20 June, according to a report last week from the plant's operator, the Tokyo Electric Power Company (TEPCO). TEPCO plans to install a decontamination system, which it hopes will remove radio­isotopes from the water so that it can be reused to cool the reactors. The system should slow the consumption of water and reduce the danger posed by the wastewater. But even when the system is up and running — expected to be on 15 June — it will generate large amounts of radioactive waste, leading some critics to question whether it is the best solution. Residual nuclear decay in the three reactors — which all suffered total meltdowns — means that they will need cooling for many months to come. TEPCO switched to using fresh water two weeks after the accident, because the salty sea water they had been using was extremely corrosive to the stainless-steel reactor vessels. The water in the reactors remains salty, even though several thousand litres of fresh water are being poured into the reactors every hour. More than 100,000 tonnes of water are now swilling around various parts of the site. In early April, TEPCO was forced to dump more than 10,000 tonnes of low-level contaminated water into the Pacific Ocean, and it has since admitted that several hundred tonnes of highly contaminated water also leaked out, exposing marine life to large doses of radiation (see Nature doi:10.1038/news.2011.326; 2011). TEPCO says it has now stemmed those leaks. The radioactive water is hampering work to bring the reactors under control and prepare for their decommissioning, says Jack DeVine, a retired nuclear consultant who led water-decontamination efforts after the 1979 Three Mile Island nuclear meltdown in Pennsylvania. Basements filled with radioactive water also put workers on the site at risk. "It makes even small things nightmarish to do," he says. Rather than simply pouring ever more water into the hot reactors, TEPCO had planned to establish a closed-loop cooling system that would recirculate water through the cores. But extensive damage to the reactors has made that impossible. Under a revised plan posted on the company's website on 17 May, the reactors will continue to be filled with a steady flow of fresh water, which will then be pumped out of the basements of the reactor buildings, decontaminated and circulated through the cores again. TEPCO estimates that it will need to decontaminate some 250,000 tonnes of water by mid-January 2012, when it hopes the reactors will finally be cool enough to shut down permanently. But the system will be far less efficient than the original plan, and will ultimately increase the amount of waste to be handled. The decontamination system is being built by Paris-based nuclear manufacturer Areva and nuclear-remediation company Kurion, headquartered in Irvine, California. The water will pass through Kurion's filters, which contain a zeolite mineral — an extremely porous aluminosilicate that loosely binds metal ions. Through a combination of adsorption and ion exchange, the filters will trap the radio­active elements strontium-90, caesium-134 and caesium-137, reducing their concentration in the water by a thousand times.